Coach Bobby Lesser was one of my earliest inspirations at having fun while working — followed by my public defender office mate Mitch Egber — rather than feeling like a starch white-shirted duplicate of all the other worker bees. 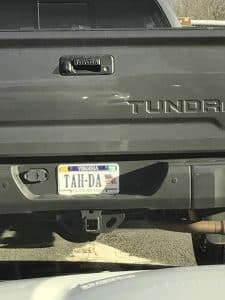 Were I superstitious, which I claim not to be, I would have remarked at the divine coincidence that this week on the way to court I saw the above-pictured pickup truck license plate exclaiming TAH-DA, which led me to check on “tah-da”-exclaiming Coach Bobby Lesser’s current status, and then learning that he passed away earlier this year, as if the license plate were telling me to look up Coach Lesser. Before learning t’ai chi, I learned tah-da, starting with my performing magic shows for children’s birthday parties starting when I was in elementary school, and then meeting Bobby Lesser, on a wonderful seven week odyssey camping cross country trip named California West that was so popular that it filled two busses in the summer of 1977, when I was fourteen. In those pre-Internet days, Bob drove down from his Peabody, Massachusetts home to our southern Connecticut home to give an introduction of his cross country tour. As he showed us photo slides of spectacular experiences in the Grand Canyon, riding on the Disneyland amusements, and making tuna salad with bare hands (each tent group had rotating work assignments), he would at times exclaim “Tah-da!” Bob’s entertaining showman approach stood in stark contrast to the owner of a larger cross country tour who was likeable, enthusiastic about his very popular tour, but much more business-like. And unlike plenty of showmen, Bob overstated nothing. He was the real McCoy. Infectious was Bob’s enthusiasm for this discovery of our nation’s national parks, deserts, the Tetons, San Francisco, and more. Enticing was joining Bobby’s tour with eight-person canvas tents (not to mention sleeping without tents in arid areas, on the floor sometimes (and being taught meditation to help us fall asleep), staying at some campgrounds that were rustic at best, and sleeping in our shorts atop our sleeping bags in Vegas because it was so hot), and ate from a chuckwagon, versus cushier tours that stayed in dormrooms and hotels. One of the counselors introduced me to Neil Young’s timeless “Old Man” and “Needle and the Damage Done” and more artists’ songs. Of the entire trip, nothing beat joining a small group hiking to the bottom of the Grand Canyon while dodging burro urine puddles, sleeping alongside the Colorado River atop my rain pancho, and witnessing the changing colors of the canyon walls as each hour passed. I was not disappointed. On the first night of our tour, many of the campers were in a big circle getting to know each other. When Bob saw that I, as one of the younger campers, was sitting alone under the stars, he encouraged me to join the others, underlining that many of them also felt awkward about meeting and being with all these new people. Maybe I sought out performing magic and on trumpet in part as a way of transcending my recurring feelings of awkwardness in earlier life, which I finally overcame by the time I became a trial lawyer 27 years ago. I believe very much in telling my teachers how much I appreciate them. I missed doing that with Bob for the last four decades, and do so here. Deeply thanking and bowing to Coach Lesser.